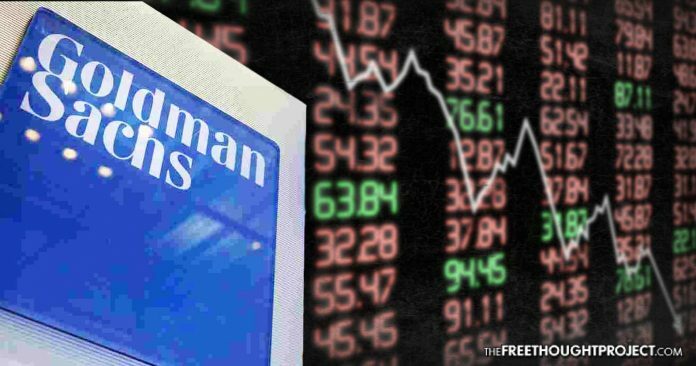 Goldman Sachs Signals Potential Crash, Tells Clients to "Hedge What You're Afraid Of"
The managing director of Goldman Sachs just issued a warning to their investors telling them to prepare for the worst and "Hedge what you're afraid of." It’s time to start hedging. As a result, Goldman has laid out a comprehensive framework for “identifying efficient portfolio hedges in the options market” focusing on methods that add alpha even as they reduce hedge costs and increase potential returns. The spike in VIX and realized volatility was large enough for investors outside the equity market to take notice and could lead to a reduction in risk-taking appetite on the margin in the coming months. It was yet another symptom of the market fragility created by lower liquidity. We believe that a shift towards risk reduction and expectation of higher volatility is likely to change the trading dynamics in 2018 and increase the value of time spent on hedging. Here a concerning observation by the Goldman strategists is that according to the latest open interest data, “a large number of S&P 500 hedges have expired over the past three weeks, leaving the average investor less hedged.” Which means that a whole new set of downside hedges will be put on, in the process pressuring risk further, if only temporarily. So how should investors approach hedging? This is laid out schematically below. In the context of the 7 explicit risks listed above, Goldman urges to hedge any/all of the specific factors that could be subject to high volatility or drawdown risk. With this method, investors have the potential to add alpha during the hedging process by choosing to protect against moves in select factors while remaining exposed to others. The emphasis of this method is assessing the efficiency of the hedge relative to the factor sensitivity rather than portfolio sensitivity. In some cases, a portfolio may already be positioned for a factor move (like higher rates), and the hedge may be positioned in the same direction (puts on treasuries) to capture not only the linear move but also the asymmetric returns associated with buying options that under-price that risk. In addition to hedging prevailing risks, or “what you are afraid of”, the bank also observes that investors should also hedge i) what they own; ii) where the risk is greatest; and iii) large vs small drawdowns. Hedge what you own: Hedging with instruments that have high correlation (low tracking error) to a portfolio provides the most reliable hedge in a wide range of adverse scenarios. This is typically the best approach when you have a view on the timing of a sell-off, but lack a strong view on which factor is likely to drive an increase in volatility. A hedged portfolio allows one to capture the upside part of the return distribution while limiting downside. This approach requires careful analysis of the major drivers of the specific portfolio’s returns and constructing a hedge that is most efficient based on current options prices. The downside to this hedging strategy is that it also hedges your alpha. Typically investors buy specific stocks and factors they expect to have asymmetric upside; by hedging these same factors, they erode the outperformance benefits if they are correct. Hedge when the risk is greatest: Timing the implementation of hedges is one of the most challenging aspects of the process. Timing can be improved by tracking risk metrics that relate to the probability of increased volatility or drawdowns. Likewise, careful attention to the calendar of events and recent volatility on those events can add value. Many investors choose to forgo the alpha from timing hedges and develop low cost hedges to allow for constant protection through time. Hedging large drawdowns vs small drawdowns: Hedging against extreme events often requires a different process than hedging against more moderate volatility. Large drawdowns necessarily have a lower probability of occurring than small drawdowns and are often driven by non-linear processes that require different modeling techniques. Careful assessment of the probabilities priced into options strikes of different strikes, terms and across assets can provide increased flexibility for efficiently hedging tail risk. The whole point of the exercise is to to identifying optimal hedges, which Goldman does by analyzing hedging options around the major market risks list above. Goldman next focuses on four main themes across key category hedges including i) Credit Risk, ii) Rate Risk; iii) Oil Risk; and iv) Broad market beta risk. We start at the top. The credit market is one of the major areas we watch for early signs of a broad increase in market risk. Over the past two months, perceptions of risk across the credit markets– as measured by spreads the IG and HY CDS indices (i.e. CDX) – have increased from historically low levels. At the single name level, however, we have seen more dispersion, with a small number of credits in the index trading materially wider over the past year. We are carefully watching three areas as we assess whether investors should be concerned about credit volatility spilling over into the equity market. Of the 36 credits in CDX HY series 30 (June-23 contracts) that are wider over the past year, 10 are media/cable/telecom names, 8 are retail/consumer, and 6 are energy. Retail: Retailer credits widened materially throughout the early part of 2017 on the back of a weak 2016 holiday period, mostly led by apparel/department stores, but improved in the latter part of the year as 2017 holiday results improved from the prior year. On average, the retail/consumer names in the HY index are 137bp wider over the past year. Energy: Over the last twelve months, energy CDS names tightened ~30bps on average, despite several names trading meaningfully wider (PKD, WFT). However, the aggregate performance has weakened across the group in recent months despite commodity prices near the three-year high. Telecom: The cable/telecom/cable names have been among the weakest performing credits in the index over the past year. The move wider has been primarily driven by the RLECs, but spreads have widened in media and cable as well. On average, the cable/telecom/media names are ~280bps wider over the past year. We are carefully watching these areas as we assess whether investors should be concerned about credit volatility spilling over into the equity market. We assess where equity options prices are attractive on the widest names to understand where investors may be able to source more efficient hedges with equity puts. Investors have been focused on the potential for an increase in interest rates for the past several years. Despite these risks, options prices on rates dropped rapidly during 2017 to reach multi-decade low and have only modestly risen in 2018. With so many investors long US bonds both domestically and internationally, investors are increasingly asking us about the potential for a near-term shift in inflation expectations (and rate expectations) to accelerate into a positioning driven sell-off in bonds. We focus on the equities with the greatest beta and correlation to Treasuries over the past three years. Each of the highlight hedging opportunities have a greater than 1.0 beta to 10 year Treasuries and a greater than 20% correlation. We focus on the names with the lowest beta adjusted implied volatility to identify the most attractive equity options to hedge this risk. The price of oil is a key driver of many sectors of the economy. Beyond its obvious impact on energy companies it has implications for consumer companies given its correlation with input costs. While our commodities team is broadly bullish on commodities in the context of strong global growth expectations, the potential for volatility always exists. Below, we identify the assets which have exhibited the highest beta to WTI oil relative to their implied volatility (after screening for stocks with higher than 50% correlation to the oil price). We find only a modest correlation between the beta to oil and implied volatility, suggesting significant opportunity to outperform for investors that expect oil to become more volatile. Often the best hedge in a market sell-off is a put on a high-beta asset with a high correlation to the market. We screen for stocks that are highly correlated with four major types of beta (US Equities, US Cyclicals vs Defensives, China and Europe) to identify the most attractive hedges for each. Below, we estimate the relationship between the beta and implied volatility for each factor and determine which stocks/ETFs have the least expensive options relative to their sensitivity to the factor. Where is the market focused on risk? There is often a strong correlation between the cost of hedges and the beta of each asset. The correlation of options pricing provides clues as to the focus of the market. Options prices across stocks are most closely related to US Cyclical Risk (R-squared of 61%) and correlated with US Market Beta (37%). China Risk and European Risk appear to be less of a focus this week although China risk was a bigger focus last week. What is the most attractive hedge across global indexes? Across major indexes, Eurostoxx 50 (SX5E) options consistently screen as attractive relative to its beta to major risk factors (US Market, US Cyclical, China and Europe).